Being a defensive driver is the best way to avoid an automobile accident. Driving defensively allows the driver to stay on high alert in order to steer clear of dangerous situations. But what happens when defensive driving alone isn’t enough to keep away from potential collisions? Being a good driver is just one step in the overall safety process and brakes are another key piece of the puzzle. Hearing the familiar brake squeal? Is your car pulling when you hit the brakes? Do you practically have to mash the brake pedal to floor to stop suddenly? If it’s been more than 10,000 miles since you’ve had your brakes replaced or inspected, bring your car in to TransMedics as soon as possible. Brake pads, rotors and other components can wear quickly depending on driving conditions in your local area and on your normal driving route. It’s important that you make routine auto brake service one part of your plan for car preventative maintenance — you can even schedule it in conjunction with every third oil change! Brake Service Not an Option? 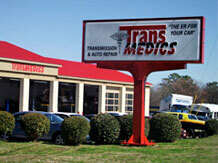 Buy New Brakes from TransMedics! If it’s too late for a simple fix or preventative maintenance on your brakes, TransMedics can replace your current brakes with new pads and more today! Don’t wait until it’s the worst happens — contact our mechanics today to schedule an appointment, or simply bring your vehicle by for service. Our team of automotive professionals is here to help!